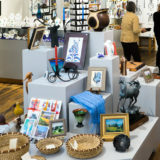 A gallery and gift shop featuring a wide range of the works of local artists & artisans. Open Mon-Sat 10:30am-6pm , Sun 10:30am-3:30pm. Closed Sundays during January and February.